JZ: I started out on piano at age 5. My family didnt have a piano but I was so into it I would practice on a printout of a keyboard on my kitchen table. Eventually, after my parents noticed I was practicing for hours every day on the kitchen table they bought a piano. I initially played classical music but switched to Fats Domino, etc. at about age 8. At age 13, I switched to guitar. At the time no one was teaching Rock n Roll so I only took a few jazz lessons and then started teaching myself and picking up info from my friends and copying licks from records. WE: I am an only child but had the good fortune to have a twin cousin born at the same time. We grew up as brothers and when cousin Jim got a long-neck Vega five-string banjo I felt that I should get a guitar. So, I was inspired to play the guitar by the folk music boom of the early sixties, but also by Elvis on Ed Sullivan. I was given my first guitar, a Goya F-11, for my fifteenth birthday and I proceeded to teach myself to play that summer from a Kingston Trio songbook. I was told by my guitar-playing friend John Zambetti that fall that I could join his band if I acquired an electric. I persuaded my parents to get me one soon thereafter. 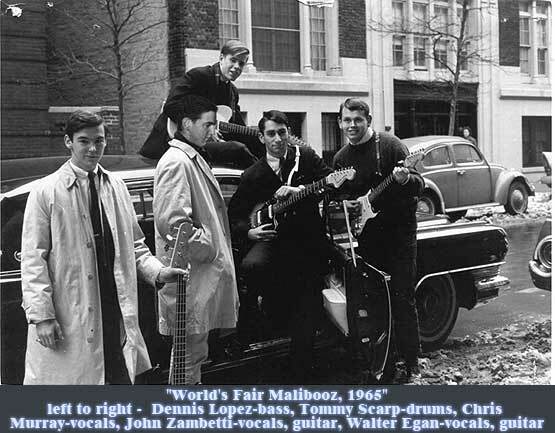 It was a brand new 1964 sunburst Fender Strat and I was soon the new member of the Malibooz, New York Citys surf band. I learned much about playing by watching John and other guitarists play (mostly on TV). Early influences were Duane Eddy and The Ventures, as well as The Beach Boys and soon The Beatles, Stones and the rest of the British Invasion bands. 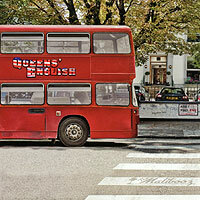 JZ: The new CD by my band, The Malibooz, is called Queens English. The QUEENS (note placement of apostrophe) is a nod to the 1964 New York Worlds Fair (in Flushing, Queens) where we played both at the New York State Pavilion and did a TV show from the RCA Pavilion. Also, my longtime band mate, Walter Egan is originally from Forest Hills, Queens. We recorded the album at my studio in Malibu and mastered it at Abbey Road Studios in London. On the CD I do vocals and play guitars, 12-string and mandocello as well as some organ, piano and even my iPhone ocarina App on one tune. The other band members are Walter Egan-vocals, guitars, Scott Monahan-vocals, keyboards, David Chamberlain-bass, and Martin Fera-drums. Given the British Invasion style of the album we were fortunate to have a coterie of original British Invaders joining us including; Spencer Davis, The Hollies Tony Hicks, The Quarrymen, Andrew Loog Oldham, Chad & Jeremy, The Troggs Richard Moore, The Fortunes David Carr, Peter Jameson and others. A special thrill for me was having original Ventures guitarist, Nokie Edwards joining with The Shadows Mark Griffiths and John Farrar on the track Venture Into The Shadows. According to those guys, it is the first time The Ventures and The Shadows have even recorded on the same track! Since Im a product of the 60s, the songs (all original but in the 60s British Invasion style) allowed me to pull out all my old 60s riffs and sounds. It was also a blast to include the variety of other instruments I got to play. We recorded the album on ProTools but we still like to do the basic tracks live, so we set up and played all in the same room. The flexibility of ProTools allowed us to fly in some tracks from guest artists at other locations. For example, The Hollies Tony Hicks recorded his parts in Manchester and then we incorporated them into our tracks in Malibu using a secure server over the Internet. WE: These days I divide my musical time between my own four-piece Walternative Band (which carries on my solo recording  eight solo LP/CDs including my four Columbia releases with my million-selling Magnet and Steel) and plan to have a new release in 2010. I record every couple of years with the Malibooz and also play in the country rock band Burrito Deluxe (a distant relative of the original Flying Burrito Brothers). My participation in the new Malibooz CD Queens English had me flying to Malibu from Franklin Tennessee, and adding my five songs to the mix last summer. The thrill of this disc is that reflects our love for the Brit Rock of the sixties after our five surf releases, and that it provided us a vehicle for our songs written in that style. While I was there I added my parts to what John had already recorded on his own of his songs. In the recording process we usually play and sing lead on our own cuts. My guitar style somehow incorporates all the different genres which I love, surf, rockabilly and rock. JZ: My first electric guitar was a 1962 Gretsch Country Gentlemen which had been re-badged as a Ronnie Lee Model, after the owner of the NYC guitar store where I was taking lessons. Being in a surf band, I wanted a Fender Jaguar, but the owner intimidated me into buying the Gretsch which he portrayed as a more serious instrument. Of course today, I wish I still had the Country Gentlemen (not to mention I went to high school with Fred Gretsch!) 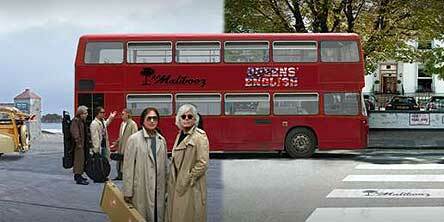 but then I really wanted the sound and look of the Jag. After playing the Gretsch about a month, I had my father accompany me back to Ronnie Lees and tell him I wanted the Jag. 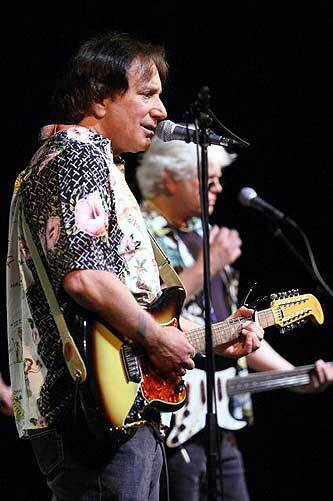 Ronnie persisted and I said the Gretsch didnt have enough treble for surf music. Ronnie said if I could tell the difference between the 2 guitars when they were played behind by back, I could have the Jag. Of course, any red-blooded guitarist who couldnt make that distinction should go back to drumming. The Jag was soon mine. I still have it today (as well as my 63 Fender Tremolux and 63 outboard reverb unit) and over the years it was been signed by many of my favorite artists including Brian Wilson, all the original Ventures, The Chantays, The Surfaris, Jan & Dean, The Sandals, etc. I probably have about 30 electric guitars and a dozen acoustics. My main ax, is a white custom shop Fender Stratocaster which I purchased from The Eagles Joe Walsh. I string it with DAddario XL .011 electric guitar strings. The interesting feature of this guitar is that it had the Roland VG-8 system built-in. At the time I bought it, I was using that system a lot, but lately I have gone back to my stomp boxes. My other main guitar is my 1962 Fender XII electric 12-string which was used a lot on Queens English. This guitar is extremely well sorted and it's one of the few electric 12-strings Ive played that is in tune (and stays in tune) anywhere on the neck. I have several nice acoustics including a Martin D-35, a Martin D-41 and a Martin DM-12. I bought the D-35 in 1971 and use it the most for recording. It has a Baggs pickup on it and over the years it has been incredibly consistent on delivering a clear warm tone. I really like to build a wall of acoustics and I really did that a lot on this album. There are layers of acoustic 6 and 12-string tracks capoed to increase the spectrum of sound. I also used my Dammann Mandocello on the song London Underground. The mandocello is strung and tuned like a mandolin but with one extra set of strings in the bass (which usually is a C, but I tune to D) brings the total string count to 10. It's more guitar size than mandolin size so it tends to sound more like a lute, but if you capo it and play it high, it can cover mandolin sounds. I also have a 1970 Fender Mustang bass which I love because its smaller scale and has a great sound. I also play a Dammann custom bass. WE: I have simple tastes when it comes to guitars and gear, if it sounds good I go for it. Except for a few years in the early seventies when I played an old Gibson SG I have almost exclusively played a Strat on stage. Currently I play a black one from 1968 through either a Fender Deluxe or a Peavey Delta Blues with a fifteen inch speaker. My outboard gear is a Korg Toneworks board or a Korg Pandora. I still have the Martin D35 I purchased in 1974. Martin is the only acoustic guitar for me. I favor GHS Boomer electric strings (.010s) and Martin light gauge acoustics. I also own a Squire Jagmaster electric, Fender and Mitchell acoustics and a Squire bass (I played bass for the band Spirit for a few years). JZ: I probably first really became aware of electric guitar hearing Al Caiola do the Theme from Bonanza. That sound really captivated me and was quickly followed by Duane Eddy who put it over the edge. (I actually still have the sheet music to Dance With The Guitar Man). I really strove for the Duane Eddy sound (which in retrospect would have sounded better on the Gretsch!). Next I emulated Lonnie Mack and especially his version of Memphis, but it was The Ventures who sealed the deal. Just looking at the 45 picture sleeve of Walk Dont Run was all I needed. I was going to be a Fender man (even though they turned into Mosritians). Nokie Edwards was the man and thats why it was especially great to record with him on this album. I was a big Ricky Nelson fan and based my vocal style on him (with a little Everlys and Buddy Holly thrown in too). Thats how I discovered James Burton. At the end of each Ozzie and Harriet Show theyd have a little section where Ricky and his band could sing so I could actually see what James was playing on his Tele. Of course, his licks were way to difficult to play but it did widen my spectrum of sounds. I next discovered Chuck Berry and moved into the world of the 2-string leads! What a revelation! Chronologically, I next focused on George Harrison. I think he is a very underrated guitarist. Maybe not the greatest technique, but he had great ideas. He rarely played the same solo twice. Always something a little different in tone or technique and it always fit perfectly. One thing I hate about the modern guitar gods is that its all technique and very little melody. The leads all sound the same to me. Hendrix!! What can I say. Where does Hendrix end and the guitar begin? Dont know. Walter and I caught Jimi when he was Jimmy James and the Blue Flames (Hopefully James Brown didnt know about this). This was early on a Teen Heaven in NYC. He had a pompadour and electric blue suit but was playing with his teeth etc. long before the Experience. Probably the most influential guitarist for me was Stephen Stills and the most influential album was Buffalo Springfield Again. He is the ultimate in the quest for tone and having the leads perfectly compliment the song. And all the hit British Invasion singles. WE: My musical influences come from Elvis (of course), Buddy Holly, The Everly Brothers, Duane Eddy, The Ventures, The Kingston Trio, Brian Wilson and The Beach Boys, The Beatles, The Stones, The Kinks, The Byrds, The Yardbirds, Buffalo Springfield, Flying Burrito Brothers, Jefferson Airplane, Grateful Dead and Gram Parsons. My guitar style is an amalgam of Chuck Berry, Keith Richards, Eric Clapton, Carl Wilson, Steve Stills, Neil Young, Peter Green, Jerry Garcia, Jorma Kaukonen, Scotty Moore, Jimi Hendrix and Lindsey Buckingham. WE: I plan to finish my new Walter Egan CD and have it out by the end of the year. I write songs as I have since I was sixteen and see no end to it, and have had some writers deals here in Nashville. In the last year my song Hot Summer Nights was the inspiration for Eminems comeback smash We Made You. I will be going to California to do a few dates with the Malibooz at the end of September as well as a solo gig at Kulaks Woodshed. I will be playing at the Gram Parsons Guitar Pull on September 18th with my country rock band the Grampyres. I play regularly around Nashville and on tour in Europe with the Burritos. I play guitar for Wanda Jackson when she plays in Nashville. I am in negotiations about being part of a rock revue playing my hits of the seventies this fall.